In the 1950s and '60s, New York City’s cooperative housing embodied the egalitarian dream of modernist architecture. My parents came of age in 1950s New York City believing in the dream of equality through architecture. My mother, a secular Jew raised in Brooklyn, and my father, a moderately observant Jew from the Bronx, both found God in modernism. They adhered to the belief that the homes we build could change the world for the better. At their core, they embraced what one scholar has described as the Bauhaus ideology of “architecture as the collective, satisfying all vital needs with the exclusion of personal demands,” which could “create a human brotherhood, with organic community ties.” On their tall functional bookcase, my parents prominently displayed a black-and-white hardcover tome titled Bauhaus the way others exhibited a bible. In 1967, their fervor was fulfilled when we moved into RNA House, on Ninety-Sixth Street between Amsterdam and Columbus, developed by Riverside Neighborhood Assembly, a West Side community organization, whose stated purpose was to “facilitate democratic integration of all people on the Upper West Side.” RNA House was conceived with financing by the Mitchell-Lama Housing program, sponsored by New York state senator MacNeil Mitchell and assemblyman Alfred Lama and made into law in 1955 as the Limited-Profit Housing Companies Act. Its mission was to provide affordable rentals and cooperative apartments for thousands of middle-income New Yorkers like my family. The state gave developers low-interest loans, mortgages, and tax exemptions to build apartments contingent upon controlled rents and sales prices below market value for a twenty-year period. Once the period of time passed, the buildings could either opt out of the program and privatize or refinance under the same conditions and remain public. RNA House was the first of a slew of brutalist no-frills, twenty-to-thirty-story super-slabs conceived by urban planners committed to the common good. The angular and monotonous Mitchell-Lama buildings lined Manhattan’s Upper West Side in concrete. Socialist housing experiments already existed in other parts of the world on a much larger scale and with greater success, notably in Red Vienna, when, between 1923 and 1934, the Social Democrats built 220,000 apartment units, making up about 24 percent of all of the available housing in Vienna. At the time RNA House was built, the city was near bankruptcy, the Upper West Side was looked down on as slummy, crime-ridden, and graffiti-scarred, and many whites were fleeing to the suburbs. But families like ours, attracted to the integrationist social agenda of the West Side Urban Renewal Area (WSURA) stretching from West Eighty-Seventh to West Ninety-Seventh, and from Central Park West to Amsterdam, the proximity of Central Park, bookstores, and movie theaters, thrilled at the opportunity to live their engineered utopian vision. My parents bought our subsidized RNA apartment below market rate for $3,800. Because we had a family of four, we were allotted three bedrooms and charged maintenance adjusted to our family income. Those with earnings above a certain amount were ineligible. At the time, my father was a mechanical engineering professor at Manhattan College, and we qualified. RNA House also set aside a share of “skewed” apartments, with reduced maintenance charges, for those in the neighborhood displaced by development. Thus the subsidized middle class subsidized the working poor. There were no inheritance rights. Once a family moved out or passed away, the apartment went to the next person on the waiting list. It was a liberal scheme of its time and place — postwar America, when the economy was booming and fair play and collectivism were dogmas. As RNA House’s original tenants, we had the pick of apartments. We chose one high up with southern exposure, opposite the noisy Ninety-Sixth Street thoroughfare, with a view of the backyard, abandoned brownstones, decrepit tenements, and the Empire State Building. Our building was a fifteen-story low-rise concrete block, wider than it was tall, with beehive windows, terraces along the corners, and a tree-lined garden in front. It was set back from the street, giving tenants and pedestrians breathing room from the rumbling, screeching traffic. RNA House was cozier than the other high-rise Mitchell-Lama towers, sometimes reaching thirty-four stories, which we watched shoot up on Columbus and Amsterdam in the late ’60s and ’70s. It resembled Kips Bay Towers on the east side of Manhattan, designed by the great modernist architect, I. M. Pei, a Chinese American informed by Le Corbusier and the Bauhaus architects Walter Gropius and Marcel Breuer. Le Corbusier coined the term “brutalism,” derived from the French phrase Béton Brut, meaning “raw concrete.” RNA House also evoked the work of abstract-art pioneer Piet Mondrian; not his primary-colored Broadway Boogie-Woogie painting but a more subdued, less-known cubist painting, Tableau No. 2/ Composition No. VII, with black intertwining lines, the spaces filled in with dabs of gray and ochre. My parents loved the clean, angular lines and the spare, geometric grid of the windows on the building’s facade. They were raised in prewar buildings with decorative moldings, high ceilings, and hardwood floors: my mother on Eastern Parkway in Brooklyn and my father on the Grand Concourse, in the South Bronx, when it was in fact grand. After the Cross Bronx Expressway was built in 1963, displacing thousands and destroying the neighborhood, the middle and upper classes abandoned the Concourse, leaving only the poor to suffer as the South Bronx succumbed to decay and pollution. Back then you didn’t have to be rich to rent or even buy a spacious prewar apartment on West End Avenue or Riverside Drive above Ninety-Sixth. But for my mother, older buildings meant poor heating and faulty plumbing. She grew up in a two-bedroom apartment with only one bathroom, which frequently clogged. Older buildings also didn’t have community rooms, a day-care center, parking spaces, backyards, or a cooperative spirit — the latter a direct result of modernist urban planning promoting integration and fairness. Over the years, long after my father’s sudden death in 1974, my mother resisted leaving RNA house, even when she could afford to invest in private property. Ninety-Sixth Street was where she’d set up a household with my father. It was also where she was politicized. Instead of living in a typical New York City building where individuals strove in isolation from one another, she belonged to a community where the collective action of the building’s residents underpinned her everyday experiences, shaping her life inside the building, her worldview, and her approach to society. The cooperative behavior of the tenants reflected the “propaganda of construction,” John Hartle’s idea that architecture itself can engender different social relations. On June 30, 2014, my sister and I sat on the floor of our childhood home, fiddling with the familiar keys, waiting to hand them over to the RNA House board. We were emotionally and physically spent from cleaning out the apartment on a deadline. After our mother’s sudden death, we were given an extended deadline as original cooperators, but the date had still arrived with us hauling out the out-of-tune baby grand piano that nobody had room to keep. Al Kurchin, the treasurer, arrived and said he’d known my mother from the beginning. He went room to room inspecting, taking notes on a clipboard, as if the apartment was just another co-op in the building, which, of course, to him it was. “We’ll have to dismantle the cabinet,” he said, pointing to the now broken but once beautiful shoji screen closet my father had built for me years ago. “You’ll get most of the equity accrued, minus the repairs.” We got $17,000 back. After fifty years, the typical private postwar three-bedroom in the area sold for a million plus. We spoke about the upcoming privatization vote, something on the minds of all the tenants. Al recapped my sentiments — how the Mitchell-Lama program was one of the most successful urban planning projects in Manhattan’s history, and how it changed the neighborhood into a thriving, diverse community, affordable to low- and middle-income people. “Now people want to walk out with a profit on no investment by privatizing, ending the affordable housing they enjoyed for years. It’s a disregard for the people waiting fifteen years on a list, which becomes obsolete,” he said. I nodded, swallowing my mixed emotions. As my mother aged, the reality that we’d lose the apartment became more pronounced, and I’d found myself furtively holding out hope for privatization; not out of the lure of a real estate sale windfall, but to keep the apartment in the family. My personal attachment to the apartment contradicted my faith, taught by my mother, in the common good. We gave him the keys and he departed, allowing us a moment alone to linger. The building that seemed so fair, that shaped our values about inclusion and social and economic justice, which we grew to love, in the end didn’t feel completely just when we had to leave it. We thought of the apartment as ours, though in the back of our minds we always knew it was not. Its sudden, unceremonious loss echoed how our mother abruptly disappeared from our lives, in the same way our father did when we were kids, taken by massive cardiac arrest. There was nothing more for us to do. We left, leaving the door unlocked behind us. Later, we learned from a friend in the building how appreciative the next family in line was to get such a great apartment high up, with southern exposure and a view of the skyline, opposite noisy Ninety-Sixth Street. In my mind, I wished them well, though I knew I could never visit to see how they transformed apartment 14E to make it their own. In summer 2017, I took the number 2 train uptown to visit my friend Jo Anne Schlesinger, who was helping her mother clean out her childhood apartment at the El Dorado, a magnificent prewar art deco building built in the late 1920s by Emery Roth, a Jewish emigrant from the Austro-Hungarian Empire who, as a result of antisemitism, was denied commissions on the Upper East Side. The El Dorado had two tiered towers spanning a block on Central Park West between Ninetieth and Ninety-First Street on Manhattan’s Upper West Side, and it was where Marjorie Morningstar took place, the 1955 novel about a young Jewish woman’s quest for assimilation through economic success and the shedding of old country ways. “By moving to the El Dorado on Central Park West her parents had done much, Marjorie believed, to make up for their immigrant origin” — the opposite goals of my progressive parents, who strove for social justice, not social success. I got off the train at Ninety-Sixth and Broadway, my childhood stop. I could walk past RNA House, en route to the El Dorado, but ever since my mother died three and a half years earlier and we’d lost our apartment, I’d dreaded visiting or even walking past RNA. I even bypassed the Ninety-Sixth Street crosstown bus so I wouldn’t have to look at it through the window. But this time I found myself going east on Ninety-Sixth Street up the hill toward my building. At Amsterdam Avenue I could’ve turned south to circumvent it, but I kept going, past a former subsidized low-income super-slab, built as part of the same late ’60s / early ’70s urban renewal project as RNA, where Rust Brown, the jazz club popular with Knicks stars like Walt Frazier, Willis Reed, and Earl “The Pearl” Monroe used to reside. When I was growing up, the kids in this massive tower threw stones at us from their backyard, adjacent and looming above, a concrete wall separating our building from theirs. Terrified, we scattered, then regrouped, only for them to throw rocks at us once more. Even in utopia, classes were divided. Over a decade ago, the building was converted into a luxury high-rise, and the previous tenants were all forced out, while my building still remained subsidized, resisting the tide of privatization. Later, the sidewalk outside was narrowed, making way for storefronts in this now-pricey neighborhood, where developers were squeezing every inch of available land into profitable commercial property. Just as history’s reformers have effected their own propaganda, so has capital. The last time I saw my mother, in summer 2013, she and I navigated single-file past the construction obstacles, debris, noise, and crowds. “Terrible, just terrible,” my mother sighed. I continued east up Ninety-Sixth Street toward Columbus Avenue and my building. As I approached, I saw the large glass RNA lobby windows stretching across the entrance. Gil, a friendly security guard who’d watched me grow up, was sitting at the front desk. I tried to make eye contact, but didn’t try too hard, and went unnoticed. I watched him chatting to a neighbor like normal, like he was where he needed to be, like all my memory was in order, intact. Just then, I had a vision of my mother. She was outside in front of the lobby, smiling and pushing her cart down the two front steps, on her way to buy food. She didn’t look ahead, didn’t see me, but she was there, in the heaven of her Just City. Jennifer Baum teaches composition at Arizona State University and Mesa Community College. She has been published in the Village Voice, Guernica, Newfound, Mutha, HipMama, and Canadian Jewish Outlook. 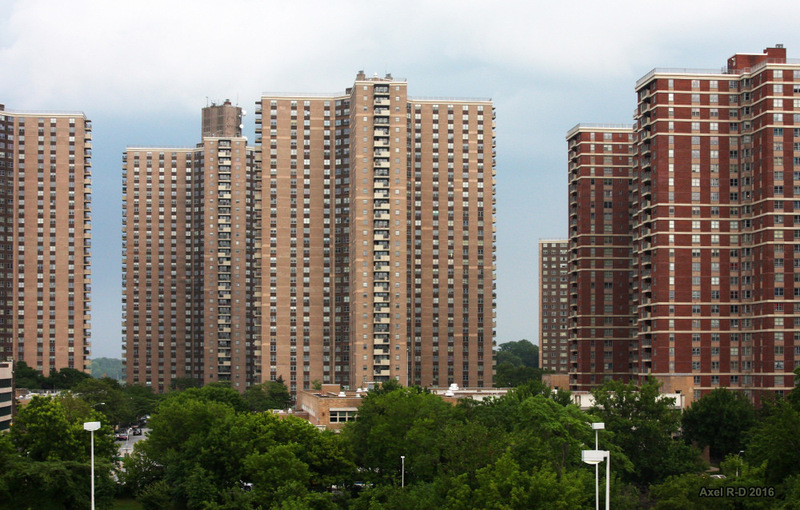 This essay is a drawn from a full-length memoir she is writing about growing up in subsidized housing on the Upper West Side in the ’60s and ’70s.